"First Sight Media made the whole process of running our first webcast much less baffling and more effective than we expected. They helped us through each stage of the process with patience and showed great creativity. On top of this they are great to work with. Highly recommended!" Introducing a new and exciting way to deliver professionally recorded video of your speaker across the web simultaneously with their presentation slides; live and/or on-demand for viewing afterwards. 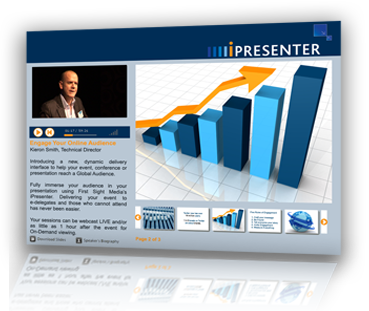 Reach a global audience by delivering your presentations online with First Sight Media's innovative iPresenter. noun. an interactive portal used to deliver presentations and events across the web. Featuring synchronised video and slides, advanced thumbnail navigation and high resolution images. As we are able to offer a complete production solution - from inception to recording, a dedicated microsite, pay-per-view options and everything in between, culminating in dynamic delivery via the iPresenter- you are able to offer users a new way to experience live presentations. PLUS, with exceptional value and prices to suit any budget, you will place your event at the forefront of the online video revolution. We pride ourselves on our highly personal service and knowledge of our industry. So, if you have an event or presentation that you would like to put online, we are happy to discuss your project with absolutely no obligation.